To estimate the duration and frequency of the period of HIV infection without detectable antibody, modelling techniques were applied to results of detection of HIV DNA by means of the polymerase chain reaction (PCR) and to data from cases in published reports. PCR was carried out with gag and env region primers on samples from 27 homosexual and 12 haemophilic men for whom stored samples were available from before and after seroconversion; serum was also tested for p24 antigen by antigen-capture enzyme immunoassay. HIV DNA was detectable before seroconversion in 4 men; in all 4 PCR was positive only in the seronegative sample taken closest to the time of seroconversion. In 3 men antigen was detected before seroconversion; in each case HIV DNA was also detected. By a Markov model, the time from infection with HIV (as assessed by detection of HIV DNA) to first detection of HIV antibody was estimated to be 2.4 (SE 2.1) months for the median individual. Modelling of cases of HIV infection with known exposure in published reports gave a median estimate of 2.1 (0.1) months from exposure to antibody detection, and 95% of cases would be expected to seroconvert within 5.8 (0.6) months. 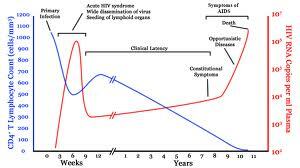 HIV infection for longer than 6 months without detectable antibody seems uncommon.